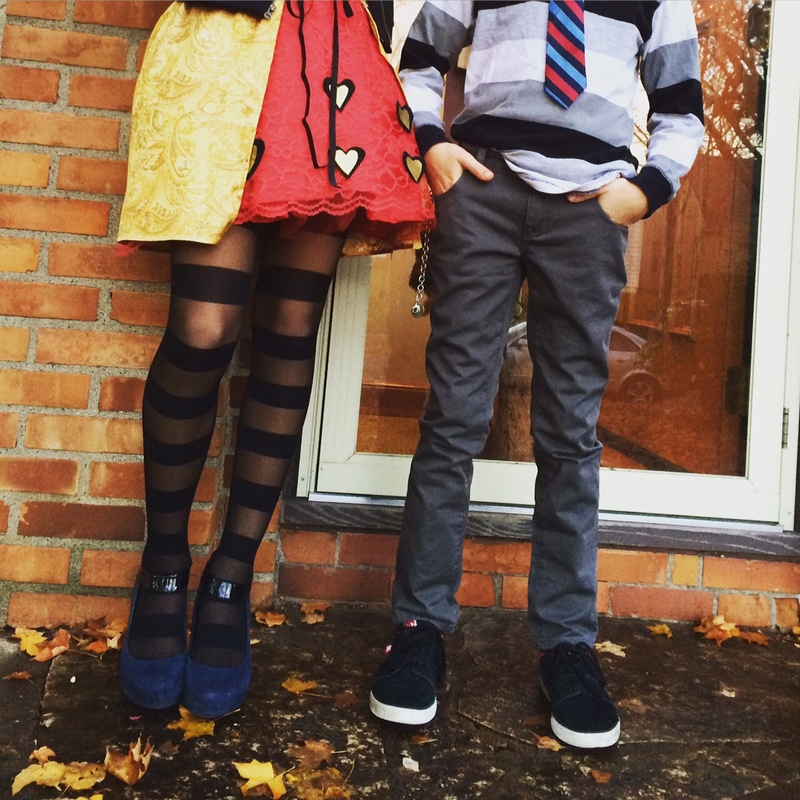 My kids inherited the Halloween gene. While you might say that this proves true for every child — what kid doesn’t like a pillowcase full of candy? — the fact that they start scheming and envisioning their costume as early as June places them in the slightly obsessive category. They owe this debt of gratitude for the love of planning the costume and going to painstaking lengths to ensure its perfection, to my husband. And maybe my handy, if not limited, sewing skills. 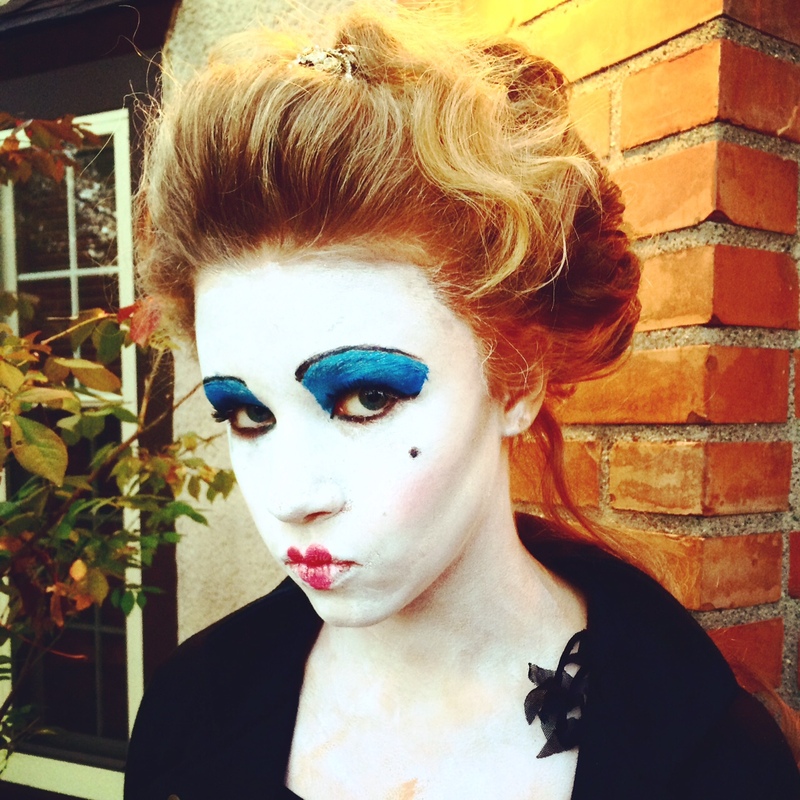 This halloween, my 12 year-old daughter, Ava, envisioned the Queen of Hearts three months before the spooky holiday neared. She found a DIY costume video from a teen pop culture icon, Bethany Mota (#SpookBook), on Tim Burton’s Alice in Wonderland version of the Queen of Hearts character inspired by the actress Helena Bonham Carter. Two months out, we made our list of stuff we would need: fabric: red, red lace and gold brocade; thread, black corset, red ribbon, black elastic, gold fabric paint, red jewels, a dowel rod, gold piping and gold foil for the scepter; funky black tights, black felt, hot glue gun and sticks and of course, the make up. The most challenging part was the red lace overlay. The entire skirt was a Project Runway #MakeItWork moment. We were three weeks in and Ava was starting to wane — this is a ton of work for a costume I’m going to wear for four hours! Let’s just buy a costume at the store. I assured her, we would see the project through. We were already $80 (+ $75 for repairs) into the project. By five weeks in, we came at it with renewed energy on a quest to find the red tutu and black corset for less than $30 and $50, respectively. 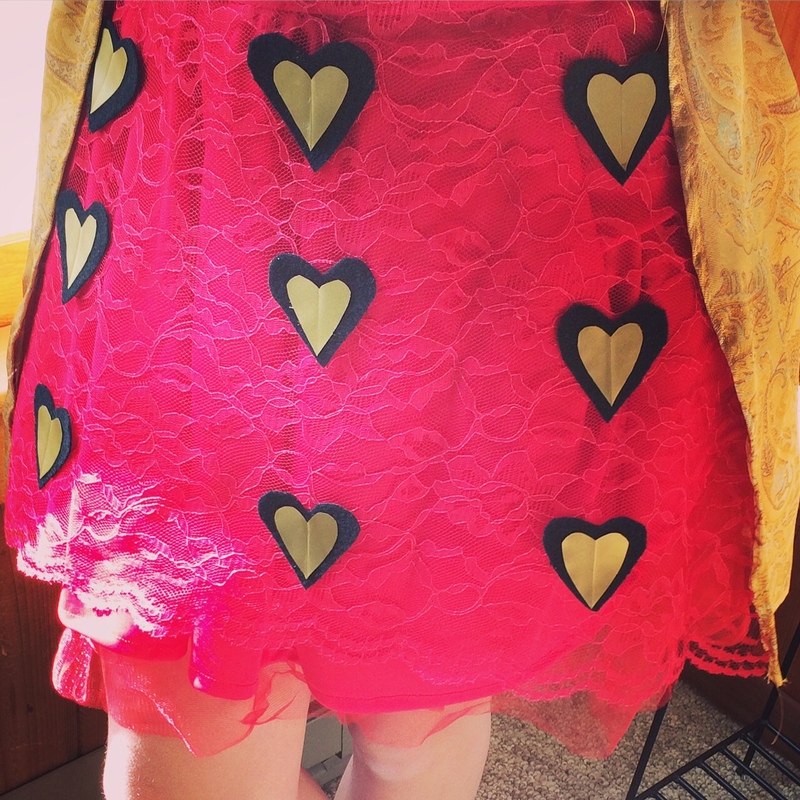 We ended up finding a $6 red tutu at Michaels and a $16 Bebe corset at NuLook Consignment. 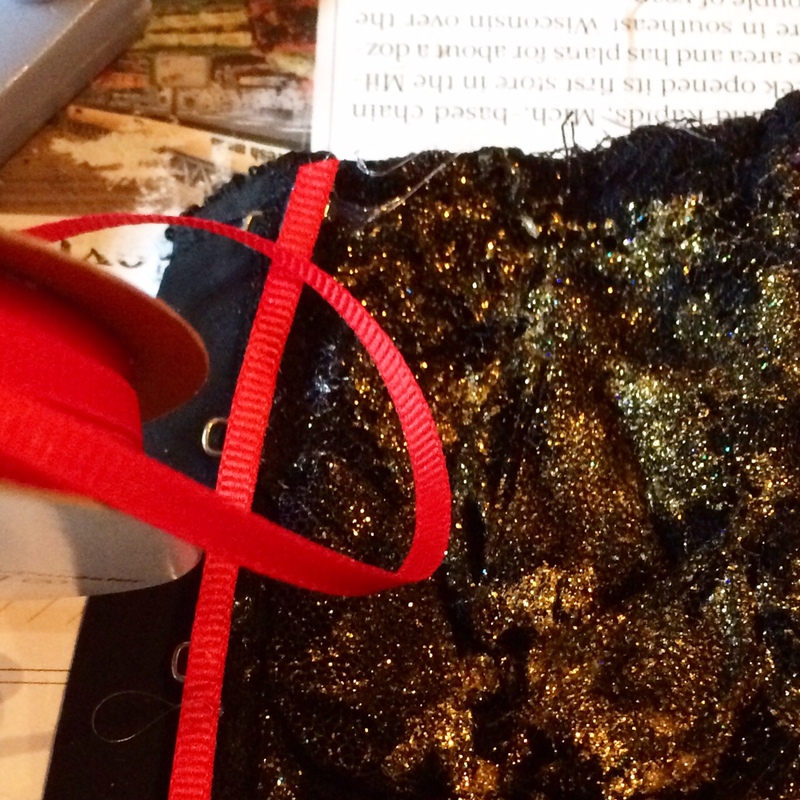 Perfect moment for a refresher course on our Halloween costume budget and the meaning of DIY. Ava was quite focused on executing the costume to every exacting detail she saw in the video. I stressed the importance of using things we already had on hand and reinventing our own version — creative and economical. We shared some very vocal creative differences again… and resolved them. At seven weeks in (one week away from Halloween), we visited Spirit Halloween in search of my 10 year-old son’s costume. 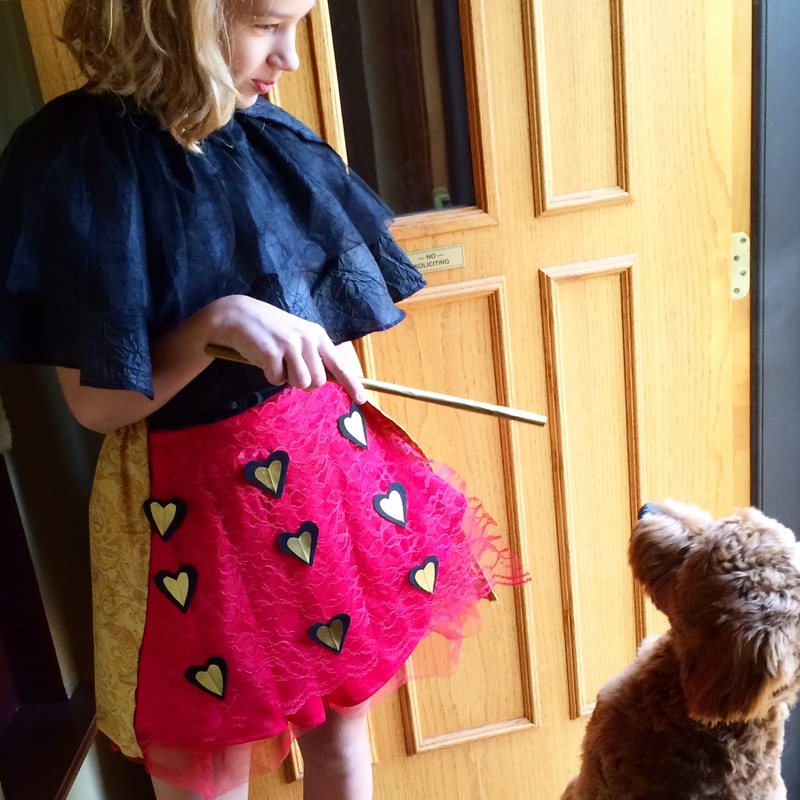 Ava was immediately drawn to the $59.99 Queen of Hearts costume in the bag. It was jumping off the rack, speaking to her. It would be so easy… She was practically begging me to buy it. I held firm if a bit incredulous she’d push to go that route after our efforts. I assured her that now was the fun part. And it was. We put all of the details together little by little throughout Halloween week. By Friday (the day before Halloween), it was pretty solid and she was fairly confident. Halloween day, I picked up black tights for $5 at Target and Ava’s aunt Katie (@Glamwhip), once again showed her awesome skills as a make-up artist. We had pinned away the night before (Pinterest Board: Queen of Hearts) and she came with all of the make-up and ideas ready to go on Halloween. I found my wedding crown and Katie used that in the glam up-do. Ava stepped into my velvet heels and the role of the queen. Ava’s friends came over around 6:00 on Halloween to enjoy hotdish, hotdogs (#mummydogs) and hotcakes (chocolate cupcakes); head out trick or treating, then just hung out at our house til 10:00. The make-up came off with some persistence (the heels had been shred long before in favor of her Converse) and the candy was counted. It was def a DIY Halloween filled with lots of good lessons on creativity and perseverance with a pricetag of $115, if that’s a factor.